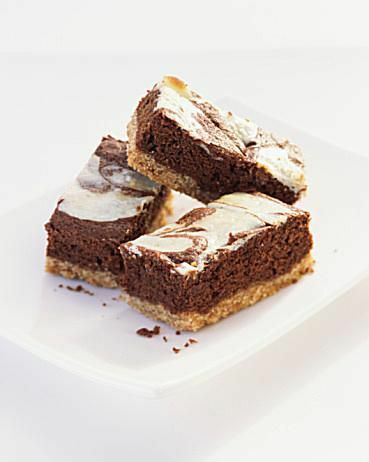 These delectable bars combine two classic cookies, tender shortbread and rich, fudgy brownies, into a one delicious bar. You may want to make a double batch of them, as they will disappear quickly. 1. Preheat the oven to 350°F. Grease an 11 x 7-inch baking pan. 2. To make the crust: In food processor or in a medium bowl with an electric mixer, process or beat the butter, flour, sugar and salt until the mixture holds together and forms a dough. With lightly floured hands, gently press the dough over bottom of the prepared pan. 3. Bake the crust for about 20 minutes or until it is lightly golden and firm when gently pressed. Remove the pan from the oven and set it on a wire rack to cool. 4. To make the brownie layer: Heat the butter and chocolate in a small saucepan over low heat, stirring often, until melted and smooth. Remove the pan from the heat and let it cool for about 5 minutes. 5. Whisk together the eggs, vanilla extract, sugar, flour and baking powder in a medium bowl until well blended. Whisk in cooled chocolate mixture until blended. Pour the batter over shortbread crust, and spread it evenly. 6. Bake the bars for 18 to 20 minutes, or until top feels firm when gently pressed. 7. Set the pan on a wire rack and let cool completely before cutting into bars. • Store the brownie shortbread bars layered between sheets of wax paper in an airtight container at room temperature for up to 5 days, or freeze up to one month. • Here are some tips for making the best cookies and bars. • Nut Variation: Add about a 1/2 cup of finely chopped walnuts, pecans or almonds to the chocolate mixture before spreading it on the cooled crust, then bake the bars as directed. • Fruit Variation: Add about a 1/2 cup of finely chopped dried cherries or raspberries to the chocolate mixture before spreading it on the cooled crust, then bake the bars as directed. • For a more wholesome texture, you can use 1/2 cup of whole wheat flour and a 1/2 cup of all-purpose flour, instead of just all-purpose flour for the crust.